WELCOME to the Catholic Bible 101 Website !! Thank you for taking the time to peruse this Catholic Website. It is meant to be informative and entertaining at the same time. The 2000 year old faith of the saints is presented here for you. 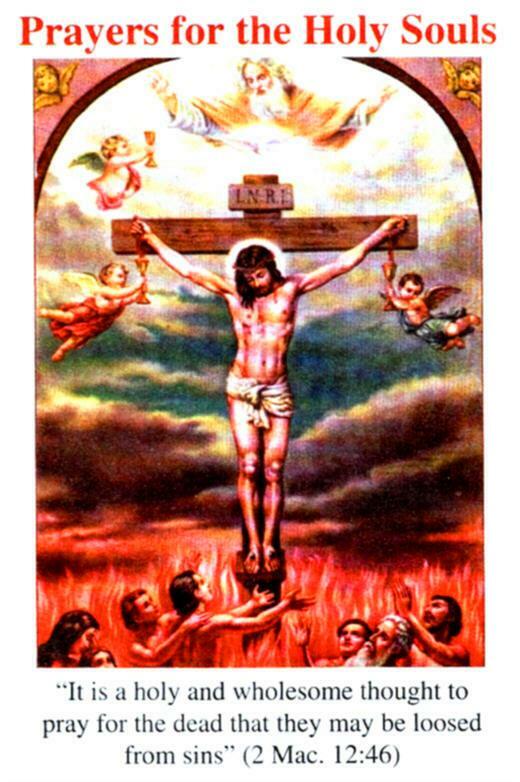 The Holy Catholic Church, created by Jesus Christ in 33 AD (Matthew 16:19), will be around until the end of time. The Holy Catholic Church is the new Israel, since the Kingdom was removed from Israel in Matthew 21:43. It is hoped that this website will expose the everyday Catholic to important doctrines that are no longer preached from the pulpit, like purgatory, witchcraft, freemasonry, indulgences, annulments, etc. This website was created to answer the question - "Where is THAT in the Bible?" 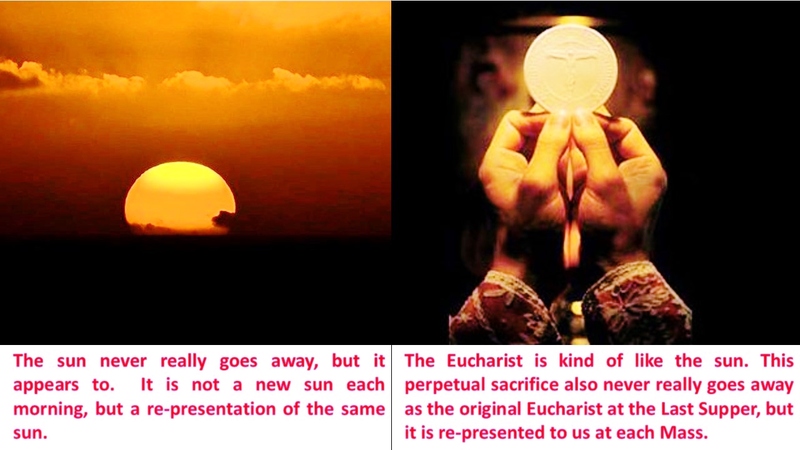 Mary and the Eucharist ! PLEASE PURCHASE MY NEW NOVEL, "SERVANT AND SERPENT, THE END BEGINS." ONLY $5 American! CATHOLICBIBLE101 PODCAST #3, Who is the "Whore of Babylon?" CATHOLIC DATING SITES - the only site exclusively dedicated to providing Catholic singles with information about online dating safety, steps you can take to protect yourself from financial and physical victimization, and more general information about selecting the best Catholic dating sites for you. To translate Catholic Bible 101, click in your language below. This translator is on every Catholic Bible 101 webpage, for your convenience. To search CatholicBible101, type in a phrase in the search box below. The Truth of the faith has been given primarily to the leaders of the Church (Ephesians 3:5), who, with Christ, form the foundation of the Church (Ephesians 2:20). 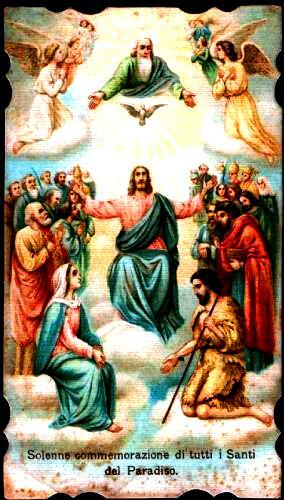 The Church has been guided by the Holy Spirit, who protects this teaching from corruption (John 14:25-26, 16:13). John 20:21: Jesus said to them again, "Peace be with you. As the Father has sent me, even so I send you." Ephesians 1:22-23: and he has put all things under his feet and has made him the head over all things for The Church, which is His body, the fullness of him who fills all in all. Eve, an immaculately created Virgin, said yes to the spirit Lucifer, and allowed sin to enter the world; Mary, an immaculately created Virgin, said yes to the spirit Gabriel, and allowed salvation to enter the world. Eve came out of Adam; Jesus came out of Mary. Adam called Eve "Woman"; Jesus called Mary "Woman." Eve induced Adam to commit the first sin. Mary induced Jesus to produce his first miracle. 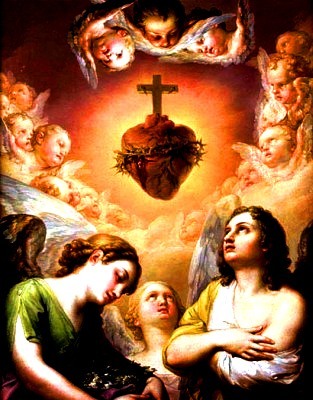 Eve gave mankind forbidden fruit for his damnation; Mary gave mankind the Eucharist for our salvation. 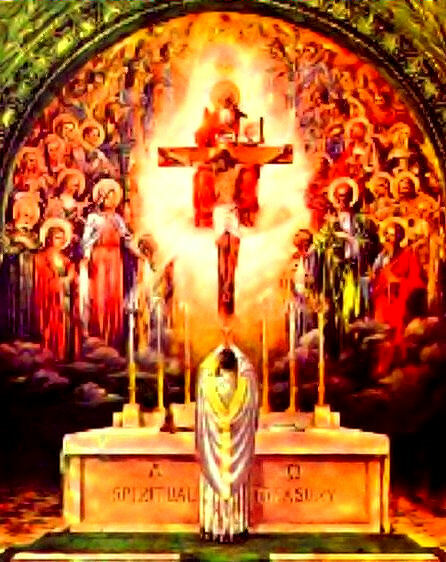 "Eternal Father, I offer Thee the Most Precious Blood of Thy Divine Son, Jesus, in union with the masses said throughout the world today, for all the holy souls in Purgatory, for sinners everywhere, for sinners in the universal church, and for those in my own home and within my family. Amen." "Even if the sins of soul are dark as night, when the sinner turns to My mercy he gives me the greatest praise and is the glory of my passion. 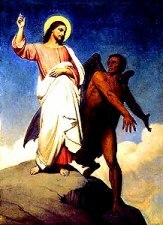 When a soul praises My goodness, satan trembles before it and flees to the very bottom of hell." "One day I saw two roads. One was broad, covered with sand and flowers, full of joy, music, and all sorts of pleasures. People walked along it, dancing and enjoying themselves. They reached the end without realizing it. And at the end of the road there was a horrible precipice; that is, the abyss of hell. The souls fell blindly into it; as they walked, so they fell. And their number was so great, it was impossible to count them. And I saw the other road, or rather, a path, for it was narrow and strewn with thorns and rocks; and the people who walked along it had tears in their eyes, and all kinds of suffering befell them. Some fell down upon the rocks, but stood up immediately and went on. At the end of the road, there was a magnificent garden, filled with all sorts of happiness, and these souls entered there. At the very first instance, they forgot their sufferings." "Acquire the habit of speaking to God as if you were alone with God. Speak with familiarity and confidence as to your dearest and most loving friend. Speak of your life, your plans, your troubles, your joys, your fears. In return, God will speak to you--not that you will hear audible words in your ears, but words that you will clearly understand in your heart. These may be feelings of peace, hope, interior joy, or sorrow for sin...gentle knockings at the door of your heart." "From all this can you now have any doubt that God wishes to save you? From this moment onward never dare to utter again: "I wonder does God wish to save me. Maybe He wishes to see me damned on account of the sins I have committed against Him." Get rid of all such thoughts, once and for all, since you must now realize that God is helping you with His graces and calling you insistently to love Him." The soul that journeys to God, but does not shake off its cares and quiet its appetites, is like one who drags a cart uphill. Suffering for God is better than working miracles. Conquering the tongue is better than fasting on bread and water. Twelve stars for reaching the highest perfection: love of God, love of neighbor, obedience, chastity, poverty, attendance at choir, penance, humility, mortification, prayer, silence, peace. The further you withdraw from earthly things the closer you approach heavenly things and the more you find in God. "All our religion is but a false religion, and all our virtues are mere illusions and we ourselves are only hypocrites in the sight of God, if we have not that universal charity for everyone - for the good, and for the bad, for the poor and for the rich, and for all those who do us harm as much as those who do us good." Why the Saints are so Powerful! Daniel 7:18: But the saints of the Most High shall receive the kingdom, and possess the kingdom for ever, for ever and ever. 2 Peter 1:3: "His divine power has granted to us all things that pertain to life and godliness, through the knowledge of him who called us to his own glory and excellence, by which he has granted to us his precious and very great promises, that through these you may escape from the corruption that is in the world because of passion, and become partakers of the divine nature." Luke 20:35-36: but those who are accounted worthy to attain to that age and to the resurrection from the dead neither marry nor are given in marriage, for they cannot die any more, because they are equal to angels and are sons of God, being sons of the resurrection. Ephesians 2:19-20: Now, therefore, you are no longer visitors and new arrivals. Instead, you are citizens among the saints in the household of God, having been built upon the foundation of the Apostles and of the Prophets, with Jesus Christ himself as the preeminent cornerstone. 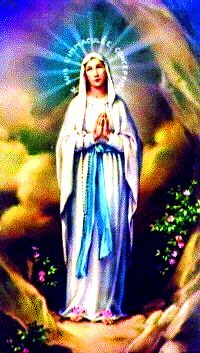 Luke 1:42: and she exclaimed with a loud cry, "Blessed are you among women, and blessed is the fruit of your womb! The Blessed Virgin Mary! The New Testament Ark of the Covenant, The Woman of Genesis 3:15 & Revelation 12, The new Eve, The Queen Mother, Our Mother, who is the most blessed woman of all time. As Gabriel said, "HAIL FULL OF GRACE! As Elizabeth said, "Blessed art thou among women." As Mary said, "My Soul magnifies the Lord", and "All ages to come shall call me blessed!" Luke 1:28: And he came to her and said, "Hail, Full of Grace, the Lord is with you!" No Mary, no Jesus. Know Mary, know Jesus! Here's how John Pacheco at Catholic Legate explains it.